As someone who is allergic to everything, I am constantly on the prowl for jewelry that wont leave me sore and swollen. 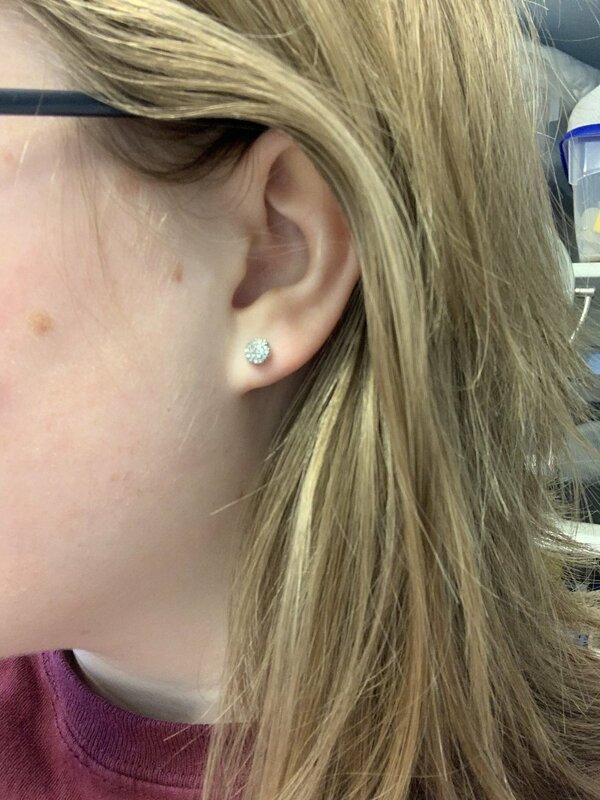 Back in October, I got my ears pierced yet again in hopes that this time I wouldn't have an allergic reaction and have to let them close up. So far, so good, and I am happy to say that even with extreme allergies I have made it to the "earring change" phase. Now that I can take out my old earrings and put in new ones, it is imperative that whatever cute jewelry I chose doesn't make my ears sore and irritated. This means no fake metal, no cheap gems, and lots of research behind every earring choice I make. After having no issues with the solid gold and silver earrings my mother so generously donated to my pathetic cause, I was ready to branch out and try some new bling. So, I turned where every young person turns when in search of things to buy: Amazon. This plentiful land of cheap knockoffs and hidden treasures had to have something for my fragile baby ears, right? Kind of. I ended up scrolling through multiple pages of earrings under searches like "titanium earrings women" and "hypoallergenic stud earrings safe for ears" in a desperate attempt to not waste my hard earned money on some fake metal crap. I found two different sets and apprehensively placed them in my cart. The first set I chose was this Fibo Steel set of four styles for $14.99. These seemed promising, they are stainless steel, nickel free, and were set a price I wasn't too suspicious of. The reviews were pretty solid and most people that had sensitive ears claimed not to have any issues at all. But how sensitive is sensitive? The company information listed on the Amazon page had a few spelling and grammatical errors that seemed as though it was second-hand English and the pictures only showed one of the four pairs that came in the set. Upon arrival, they were all individually packaged in a sealed bag, but only three of the four pairs came with a little paper holder. I washed them in hydrogen peroxide like I do all my jewelry and dried them with a clean towel. I tried the round sparkly pair, and after wearing them for a little over a day I was having no issues! I can usually tell right away if I'm going to have a reaction, and I seemed to be off the hook! This was an incredible victory for my tenuous ears, Amazon appeared to be in the clear. If I had to rate these earrings, I'd give them a solid "allergy sufferer friendly" out of 10. The Second set I found was slightly more suspicious, but they were too adorable to pass up. This Hefanny Jewelry set of 10 was priced at $10.99 and claimed to be saving you 45% off the original price. The English in this listing is much more choppy and the reviews were mostly positive but only talked about the look of the earrings, not the way they felt. These earrings are unique, they come in three parts. The stud, the extra flowery piece, and the rubber backing (of which I received a total of 25) are all separate and allow you to mess around and change up the look. When they got to my house, I immediately noticed that they were a somewhat flimsy metal and despite saying on the listing they were hypoallergenic and made of "environmental metal alloy" I was not hopeful they would leave my ears unscathed. I was impressed with the packaging, however. Each pair came in its own little bag and the package included a tiny plastic storage box. After washing with hydrogen peroxide I was ready to test them out. The first pair I tried was the gold sunflower pair with the pearls. For the first several minutes everything was okay, so I put in the rose gold lotus flower pair. They were okay too, but after about 45 minutes I started to feel it; the itching, burning sensation that comes with cursed jewelry. Gosh Darn it I had such high hopes! The next morning, however, I didn't have any residual effects from the earrings. I think they are risky, but might just be safe enough to wear and snag a cute picture or two and then take them out. If I had to rate these I'd give them a "Disappointing, but predictable" out of 10. In hindsight, I should have seen this coming. So as far as buying earrings on Amazon goes, I'd say its either a success or a total failure. 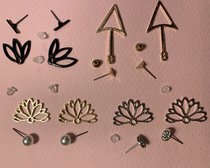 If you don't have sensitive ears and have never had a problem finding jewelry then you won't have any issues finding something cute and stylish for a good price. If you're like me and finding things that don't set your body on fire is like trekking through a minefield, then I would say Amazon is a "shop at your own risk" type of endeavor. I've got to say, I am more impressed than I thought I would be, but I definitely don't see myself doing this again.